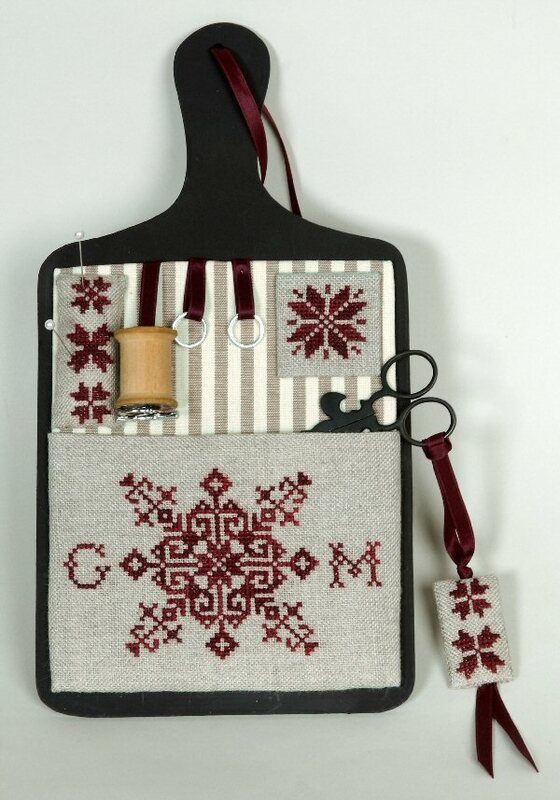 This sewing set embroidered with Icelandic traditional motifs is mounted over a lined Skirtex panel and then glued to a wooden blackboard. This lovely set has a pocket for scissors, a small pincushion, a ribbon loop for the spool, two metal rings for the threads and a magnetic needle minder. It is stitched with silk threads from Gloriana Threads over natural linen from Fratelli Graziano, Italy. This model has been inspired by the wonderful book “IslensK sjónabók – Ornaments and Patterns found in Iceland”, of Birna Geirfinnsdóttir, published by Heimilisiðnaðarfélag Íslands (The Icelandic Handicraft Association). I had the permission to reproduce the motifs of this book and I am very grateful for this. The book itself is a wonderful publication with translation in English and it is a huge encyclopedia of motifs from Iceland. The Iceland Handicrafts Association is a vibrant group who preserves the National Icelandic Costumes from around 1800 onward. A limited number of extant costumes and photographs have been used to research the embroidery, clothing styles and fabrics. The community recreates the costumes, embroidery and jewelry as part of maintaining the cultural heritage. There is a small shop (really a room) in the building.